Despite the many exotic places Pete McCarthy has visited, he finds that nowhere else can match the particular magic of Ireland, his mother's homeland. In McCarthy's Bar, his journey begins in Cork and continues along the west coast to Donegal in the north. Traveling through spectacular landscapes, but at all times obeying the rule, "never pass a bar that has your name on it," he encounters McCarthy's bars up and down the land, meeting fascinating people before pleading to be let out at four o'clock in the morning. Written by someone who is at once an insider and an outside, McCarthy's Bar is a wonderfully funny and affectionate portrait of a rapidly changing country. Pete McCarthy was born in England to an Irish mother and an English father. He was the writer and performer of many travel series for radio and television in the United Kingdom. 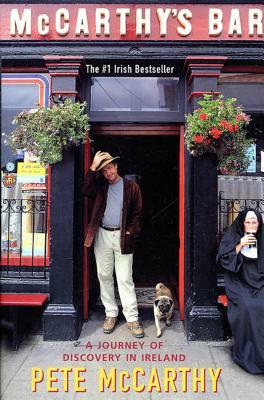 A bestseller in Ireland, Australia, and the United Kingdom, McCarthy's Bar was his first book.